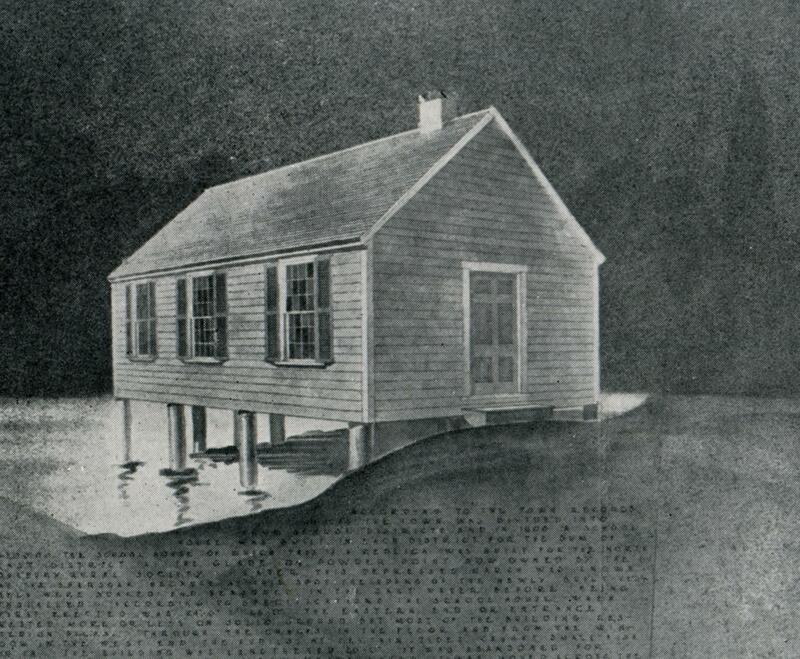 Sketch of the Point School. 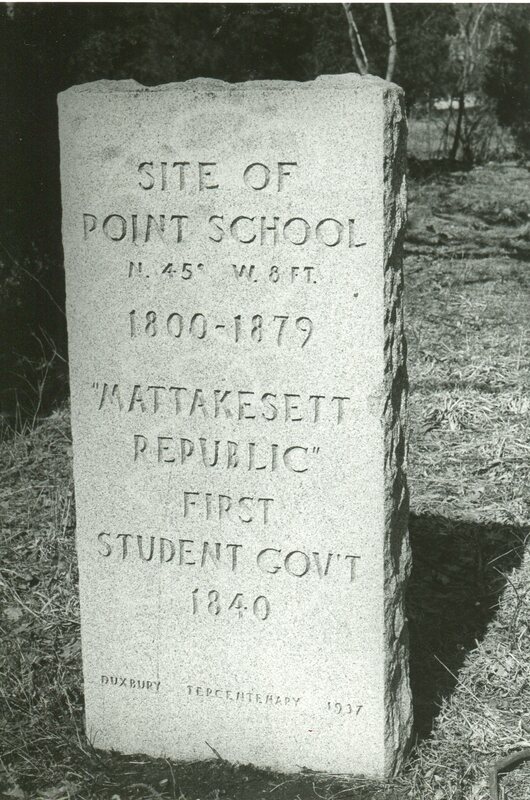 In 1840-41 when this journal or “Report of the Secretary” was written, The Point School was one of nine common schools in Duxbury (there would eventually be 12 neighborhood schools throughout town). The school, built in 1800, was located on what is today the corner of Powder Point Ave. and Bay Pond Road. The students at the Point School ranged in age from approximately 8 to 17, but it was only the older students who participated in the student government that produced this journal. The students mentioned are: John Bradford, b. 1823; Daniel Brewster, b. 1825; Lucy Brooks, b. 1825; Joan Chandler; John Cushman; Anna Delano, b. 1825; Henry Leach; Jane McLauthlin, b. 1925 (she married her classmate, John Bradford); Rufus McLauthlin; George F. Nickerson, b. 1824; Rueben Peterson, b, 1828; Jane Smith; Jonathan Smith, b. 1824; Samuel Weston; Roland C. Winslow, b. 1825; and Amasa Witheral, b. 1824. Their teacher was Mr. Edmund Gifford (1810-1883) of Pembroke. Gifford married Lucy Winsor Sampson, a Duxbury girl, in July of 1841, just a few months after this record was kept. The Giffords moved to Elgin, Illinois where Edmund became an attorney and the superintendent of schools. Later he was a judge in New Orleans, LA. According to a student, Mr. Gifford told them on the first day of school, “[we] must govern ourselves, or we could not help to govern our country wisely.”  They called themselves the “Mattakeeset Republic,” after the Native American name for the area. In 1878 the location of the Point School was moved to an empty lot on Cedar Street. When the Alden School was built in 1927 the Point School was closed. What follows is a portion of the journal kept by the Mattakeeset Republic. The entire journal is published under the Journals tab at the top of this page. This school was called to order by Mr. Edmund Gifford and it was voted to adopt the card of recitations that we used last winter. It was then voted that George Nickerson continue in the office of secretary. Mr. Gifford then proceeded to organize the classes which took nearly all day; George Nickerson resigned his (office) of secretary and Jane Smith was chosen in his stead. John Bradford was chosen to keep the register, the school was then dismissed. 29th. Considerable noise today and the schoolmaster spoke of it several times. There were a few toasts today and it was moved to have an evening school but as Mr. Gifford could not come the motion was not put. The school was closed by reading in the testament. 30th This afternoon we wrote compositions. It was moved that we have an evening school but the vote was not taken as Mr. Gifford could not attend. School was closed by reading in the testament. 31st. Nothing of any consequence happened this day. A motion was put in for an evening school but did not put it to vote as Mr. Gifford could not attend. January 1, 1841 — Voted that the class in the Fourth book select pieces. Voted that we have a debate every Wednesday afternoon and that we choose a committee to prepare questions to debate upon on said occasions. Voted that the exercises of the school shall close at ½ past 2 on Wednesday afternoon that we can have more debating. Voted that we choose a committee to bring in questions for debate. Amasa Witherell, John Bradford, & Jonathan Smith were chosen. January 2, 1841 The Committee to bring in questions brought in 3 and they were all accepted. Voted that we accept the third one for debate on next Wednesday which was, Which is the more dangerous a sailors life or a carpenter’s? Voted that the schoolmaster should appoint two scholars to speak on each side. Voted that no scholar under 12 years of age shall speak in the debate. January 4. Voted that Mr. Gifford should not go beyond the sound of the bell. Voted that the scholars that have writing books should write a page in them every day. Question where was the first railroad and who was the Inventor? 5th Voted that the basin on the stove should be cleaned out every morning by the monitor. 6th Wednesday afternoon we debated on the question for debate and it was decided in the negative that a carpenters sailor’s life is the most dangerous. Voted that we take up question 1st for debate. Ought our Pilgrim fathers to be justified in their treatment of the Indians? George Bradford & Roland C. Winslow appointed to speak in the affirmative, & Reuben Peterson & George F. Nickerson in the negative. 7th Voted that the second class in first class book shall take turns in selecting pieces to read… Voted that the Class in third book select pieces to read…. 8th there was nothing done today of consequence. 11th Voted that we have an evening school this evening for the purpose of spelling and ciphering and Daniel Brewster was appointed monitor. At ½ past six the school was commenced. At ½ past seven Mr. Gifford not coming we chose sides and spelt. After that we took up the question for debate and after a short debate laid it on the table for debate on Wednesday afternoon. School was then dismissed. 12th Voted to have an evening school this evening for the purpose ciphering and spelling. Paper by J.W. Smith, Feb. 1, 1908. This entry was posted in Uncategorized and tagged 1840, Duxbury, Edmund Gifford, Point School, schools, student government. Bookmark the permalink.